Ok so I know it's January and everyone is *SO* over Christmas, but I know I'll kick myself if I don't blog this as I can guarantee I'll forget! 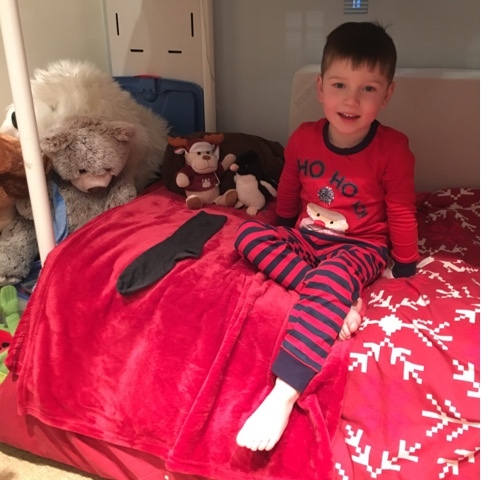 Because we were both so ill before Christmas I missed literally loads of post so you might just see a few pop up during January, sorry about that but I hope you understand and just scroll on by if you are not interested! 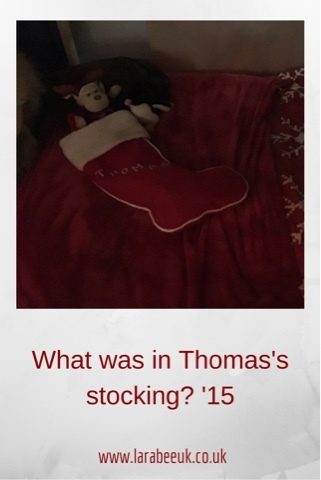 I try not to spend too much on T for his stocking and in the past have collected gifts throughout the year, this year I didn't and his stocking was a bit of an after thought, I want to make sure this doesn't happen again. On to the contents, I like to have 10 small fillers in T's stocking but as I left this too late I only had 8. 1. Hobbit Lego kit, free from the daily mail (well 60p as I don't usually buy it) I collect these whenever they come up and pop them in a box for rewards or little incentives throughout the year. It was great to know I could turn to it to add this to my stocking fillers. 2. Fire engine fake Lego, I got these from a facebook local selling page, they were 4 for £2 I knew 2 'lego' items wouldn't be too much for him. 3. Lego soaps, these were £1.95 for 8 on eBay. To be honest I was expecting them to be much bigger and thought I could give half to my nephew but 4 would have looked ridiculous so T got them all, they have been a bit hit though so I am tempted to make some with him sometime. 4. a whoopee cushion, £1.99 for 2, he *LOVES* his whooppee cushion, we gave one to my nephew too, best £1 stocking filler ever. I'll be finding somewhere cheaper to get some for next year as I can imagine they won't last long, going by how he jumps on it! 5. Christmas paint your own suncatcher, I thought that he might do this over the Christmas break, but quite honestly he wasn't interested. May re-think craft things in stocking next year as I don't think it's gimmicky enough, he's just to used to doing crafts, they are not really exciting enough for a stocking. This was £1 on 3 for 2 so 66p! 6. Each year I get a personalised Christmas ornament for T's stocking, this year I left it too late so I added this one which I got in a secret Santa, I added his name with a sharpie, he loved it and it went on his tree with the others. Free. 7. 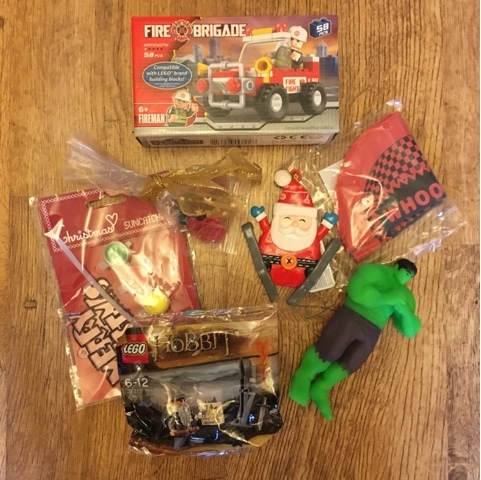 Stretchy hulk, £2.99 from tesco, quite expensive for a stocking filler in my opinion but he loves it and it was perfect. 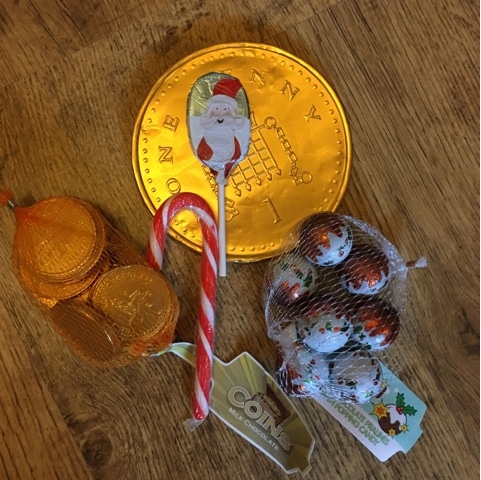 Along with the gifts, I like to put some chocolate and sweets in the stocking, when we were children we were allowed to open our stockings and eat anything in them as soon as we woke up, T also can do this although, being on his own, he came in to open it with us at about 7am, not bad at all!! I also added a packet of pistachio nuts and a satsuma. So that I can be nicely organised. 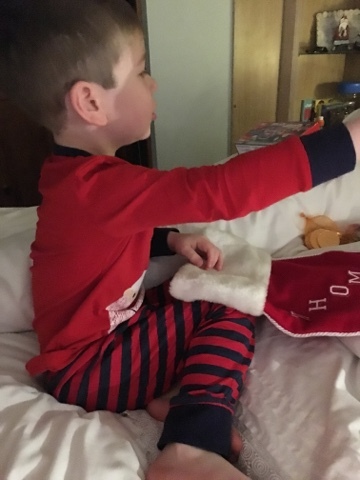 We have a little tradition in our house, where one of daddy's socks gets put on the bed and Father Christmas replaces it with a nice jolly, filled one! So far this is working perfectly and it makes life a lot easier! What did you put in your stockings? Do you have any recommendations for cheap/free gifts I can start collecting now?